Here’s an alternative recipe with ham and a slightly smoky flavor. 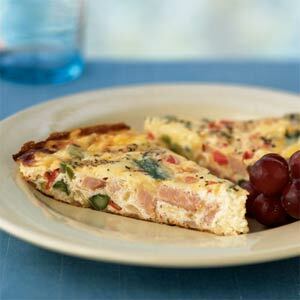 The recipe calls for ham, but we use turkey ham, a lttle leaner and healthier. In medium size bowl, using a fork, blend together eggs, Parmesan, pepper, and salt. Heat 12-inch non-stick, oven safe saute pan over medium high heat. Add butter to pan and melt. Add asparagus and ham to pan and saute for 2 to 3 minutes. Pour egg mixture into pan and stir with rubber spatula. Cook for 4 to 5 minutes or until the egg mixture has set on the bottom and begins to set up on top. Sprinkle with parsley. This one comes courtesy of Alton Brown at the food network.